Google Maps has become an important tool that helps us locate ourselves in any city in the world. For this reason, the app added new options when taking a taxi service as it will display the estimated times for various private and public companies providing passenger transportation. Also the app will take care of showing the estimated service fee for this we must have the application you plan to use (for example, Uber) installed. It also shows the estimated arrival at the destination marked time, the time it takes the taxi to our location. Even able to compare different taxi services in the city there and choose the one that suits you. 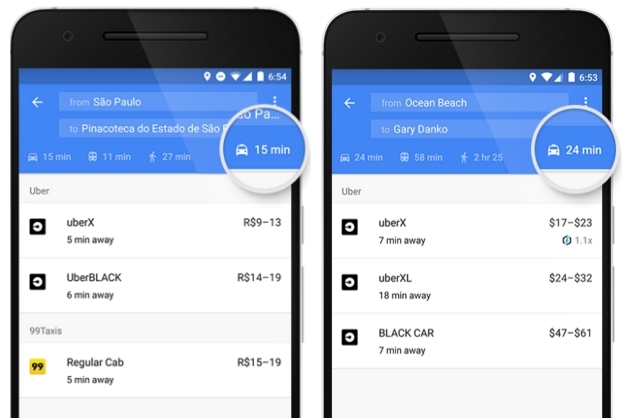 As for Uber, Google Maps will display UberX rates, UberXL and UberBlack. Still, it’s good to see Google branching out a bit to provide customers with some choice, and the addition of a ride-share tab – putting such services front and center, rather than buried under public transport – suggests the feature will grow rapidly from here. The new feature is rolling out to android users over the coming days and Google says it will soon arrive for maps on iOS device too.